Ammonites are tiny shelled creatures that scientists say lived in the oceans, billions of years ago. Considering that no one has ever seen one alive, we think we know a lot about them. Why do scientists think ammonites once lived in our oceans? 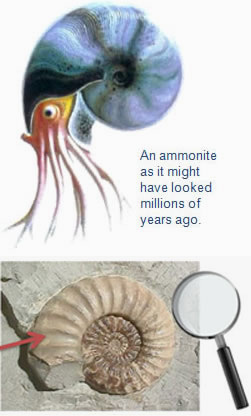 Ammonites were plentiful, say scientists, and we know this because their fossils can be found in many places. Although ammonites are sea-creatures, the sites where the fossils are found are no longer seas. We now find them in rocks! Denise Balmer is a geologist and she visited students at Trevelyan School to explain what else ammonite fossils can tell us about the past. Find out more by watching the video – and discover how geologists are able to use the evolutionary stages of ammonites to help them discern the age of rock formations around the world.